South of the Border: Steak Tacos and Homemade Salsa – Pao Says, "Open Wide!" At Trader Joe’s, they sell a pretty sizable vacuum-sealed flank steak at a very decent price. I like buying things that come in tightly-wrapped packages like this because I can buy in bulk and freeze without the worry of freezer-burn ruining the food. 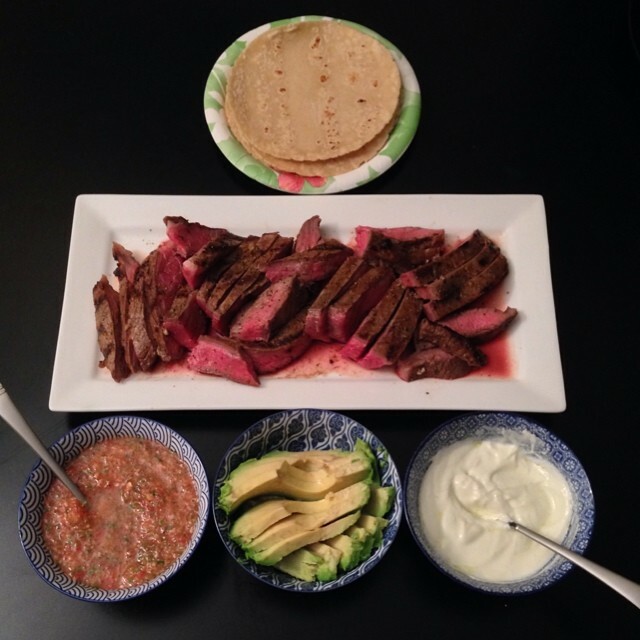 So I had a ton of flank steak and some tomatoes… Did somebody say taco night?? The flank steak was pretty simple. I seasoned it with Adobo (a staple in my household), crushed garlic, lime, and olive oil… DAS IT. Let that sit and marinade for about 20-30 min. In my AWESOME NEW NINJA BLENDER (great for crushing… pretty much anything and everything), I combined 3 tomatoes (I cut them into quarters just to make it easier to process), half a small red onion, a large garlic clove, some cilantro (a handful), half a jalapeño (with the seeds… this you can adjust depending on how much heat you want. I like a medium salsa so half a jalap is good for me), a dash of olive oil, and about half a lime. you can increase, sub, or decrease any of these ingredients to fit your taste, but these are the basics. Once its blended, you can add salt to taste. For a different, smoky twist to this salsa, take the seeds out of the tomatoes and char them (along with the jalapeños) over a grill. This is some next-level salsa. To cook the steak, you can either grill it or cook it stovetop. I did a combo with a stovetop grill/skillet. If you want the meat to be medium-rare, take it off of the heat while its a little less cooked than that and set it aside on a plate (cover the meat with foil), so it can rest. It will continue to cook a bit and it will retain all of the juiciness you would lose if you just cut into it immediately. Cut the meat AGAINST THE GRAIN! Super important because otherwise, it’ll be really tough.